René Magritte is omnipresent in Brussels. Not only in the Magritte Museum on the Place Royale and the René Magritte House in Jette, which for years was his main residence in the capital. But also, numerous other locations in Brussels tell a fascinating story of this emblematic figure. Discover and experience the surreal world of Magritte in Brussels. 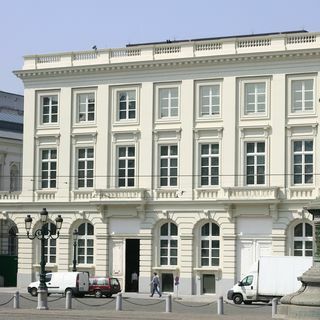 The centre of Brussels houses an exceptional collection of works by the Belgian surrealist René Magritte: the Magritte Museum. The more than 200 works assembled here comprise the richest collection anywhere in the world. The multi-disciplinary museum houses paintings, watercolours, drawings, sculpture, painted objects as well as advertising posters, sheet music, old photographs and films shot by Magritte himself. Towards the late 1920s, René Magritte, who belonged to a group of Brussels iconoclasts, drew much attention through the radical way in which he broke with traditional visual language. He quickly became one of the major players in surrealism, both within and outside of Belgium. 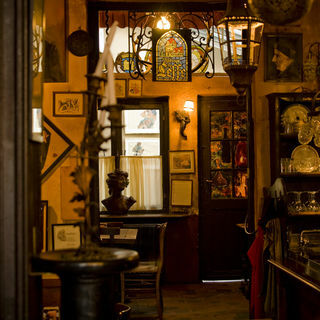 It was in the mid-forties that Gérard (Geert) van Bruaene, Brussels’ anarchist poet, bought this artistic little café. He then named it “La Fleur en Papier Doré - Het Goudblommeke in Papier”. Geert van Bruaene was close to the surrealist group in Brussels and liked to welcome his friends Louis Scutenaire, Marcel Mariën, E.L.T Mesens, Irène Hamoir and Camille Goemans there. René Magritte used to drop in from time to time. It was also the favourite bistro of Pierre Alechinsky, Jacques Brel and Hergé. 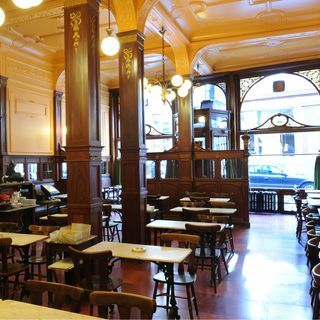 This traditional little café-bar, where a giant portrait of the surrealist group still hangs in pride of place, has retained its charm of yesteryear. People go there to experience the particularly unusual and eclectic ambience, imbued with history. “If Magritte paints as well as he plays chess, he still has a long way to go”. Legend has it that that was how René Magritte was described when he tried to sell his paintings in the Greenwich. The Greenwich, a listed café, is worth going out of your way for. Its reputation is owed mainly to the fact that it was the temple for chess players and that Magritte used to play there often with other key figures of surrealism in Brussels. Nowadays, the Greenwich is a brasserie serving very typical Belgian dishes. Its interior is bound to take you back in time to the days when Magritte and his friends used to put the world to rights over a good Gueuze. 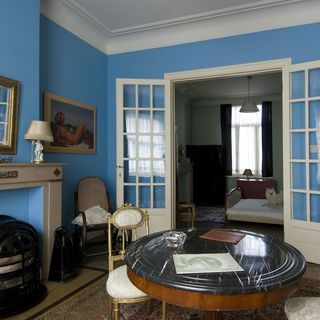 The René Magritte Museum is installed in the house where the famous surrealist painter lived for twenty-four years. This living environment, recreated with authentic furniture, inspired Magritte in his work. In the dining room of this rented apartment, the artist painted nearly half of his body of work. This quiet spot was where his most creative period developed, resulting in awe-inspiring paintings. 135 Rue Esseghem also became the headquarters of the Belgian surrealists. The artist’s friends used to gather there every week and organise all kinds of happenings. Their meetings resulted in many subversive activities, books, journals and pamphlets. These activities are clearly illustrated on the two upper floors of the museum through original works, photographs, objects of interest, letters and personal documents. This dwelling was restored and turned into a museum from 1993 to 1999. It is designed as a permanent tribute to one of the most brilliant artists of all time. Although more discreet than Père Lachaise cemetery in Paris, Schaerbeek cemetery can also be considered as an essential stop on any tour by visitors to our capital. 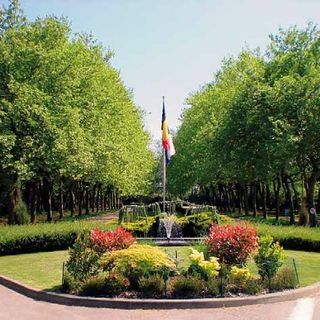 It offers a peaceful setting for a walk to discover several iconic personalities that have left their mark on Brussels. Several have a connection to Surrealism, such as Magritte and his wife or the poet Marcel Mariën, who sends us this message from beyond the grave «Il n’y a aucun mérite à être quoi que ce soit» (There is no merit in being anything).